I feel like some things being made in SL right now are being made JUST for me. Bright colors, floral patterns, and lots of cuteness! I am not a person who can resist anything in a bright bright color, so I’m happy as can be right now! Uber‘s Neon theme this round is giving me so much life. I am in total love with the Koko Half Crop shirts from Blueberry for this round. I have been looking all over for decent mesh t-shirts to fit on my mesh bodies, and these are wonderful!! Of course Truth‘s Sukie pigtails with the optional studded kitty ear headband is just as cute as can possibly be! And the Miami Neon sunglasses from Izzie’s match all my neon aqua dreams. And finally, Reign put out these Jellysee Sandals in the mainstore [whaaat? Not an event? Get outta here!] and I just squealed when I saw them! I’m wearing them as flats, but with a nifty little HUD, you can make them platforms. There IS an unrigged version which seems to be sized already for little feet, so kids, go get some jelly shoes! Happy shopping, my colorful bunnies! Back in the 90s when Aerosmith released the “Crazy” video, I fell in LOVE with it. And I wanted a cool friend to run away with in my awesome 90s clothes. Coldlogic is bringing us a bit of 90s realness with their latest release, so I grabbed one of my cool friends for a pic! Kirsten and I are both wearing the new Esper dresses from Coldlogic. These are cute spring dresses and they come with plaid shirts that tie around the waist. They come in different colors, and have standard sizes and mesh fitted for the Slink Physique body. We’re also wearing the new Nymph lace up boots from Livalle that are out at the IDK Fair this month. The boots come in several colors and have several sizes for different bodies and avatars. But they are rigged, so keep that in mind. Thanks for blogging with me, Kirsten! Hello, bunnies! I’m sailing away today! Pose Fair ends on the 25th, so you just have 3 more days to go buy all the goodies! Like the Paper Boat pose prop from Elymode! There are 5 poses in the boat [although with the mirrors and the ones that are just slightly adjusted, you really get more] and 8 different textures to choose from. For you kids out there, there is a kid sized Paper Boat with more kid friendly poses. You can even bring a friend along on your ride in both the adult and kid boats! If you have trouble sitting in the boat, check and see if you’re on a sim with a sim surround. If you are, you might need to fly above the surround with your boat before you can sit. At least, that’s what happened to me on 2 different sims. Fri.day is out at Kustom9 this month with the Bailey.Loafers. I’m so thrilled with these because sometimes you just need a comfy and cute loafer to slip on so you can run out the door! These come in several colors and fit the Slink and Maitreya feet. No photos today because I did a video tutorial! I KNOW, I’M SCARED TOO! I take a lot of “action” photos when I’m hanging out with my family and friends and doing the Photoshop trick where you take 2 photos with a smile and without so you can cut and copy and paste doesn’t always work since there is no guarantee that I’ll be in the same exact position twice. When I mentioned my smile shape, several of my friends didn’t know what I was talking about, so I thought I’d do a little video just in case others might want to give it a try. Are you down for looking hot after the apocalypse? Then you will love what’s coming up tomorrow! The End is a quarterly, post apocalyptic themed sales event and FATEplay will be there with some awesome new costumes! I’m wearing Tina and I feel like no one is going to mess with me in this outfit! The outfit contains the top, pants, mask, belt, and boots. There are a few different colors of this outfit, and I’m wearing it in the Alt color. You can also purchase the Turner boots separately if you want. And there is a matching outfit for the guys, too! The End starts tomorrow, April 16th, and runs until May 5th. I can’t wait! Happy shopping, survivor bunnies! Hey, guess what’s happening on the 17th? The Wayward Hunt!! You may remember it as ZombiePopcorn, but it’s rebranded and better than ever! There are SO many goodies from over 100 stores for you to get. And? IT’S ALL FREE! You get started at the Wayward Bakery & Antique Shoppe, and there is also a hunt group that you can join. But let’s see a couple of goodies! I’m wearing the Maxxi+Dress from Vincue that is a hunt gift and it’s just adorable! It has a little HUD so you can wear the dress in pink and white, blue and white, or black and white. The brand !Oleander [no relation to my family!] is one that is slightly new to me, but if they keep putting out cutie cute hair like the Oz hair for the Wayward Hunt, they might have a fan for life! The hair is “dipped” and there is a HUD so you get 5 colors. I love it! 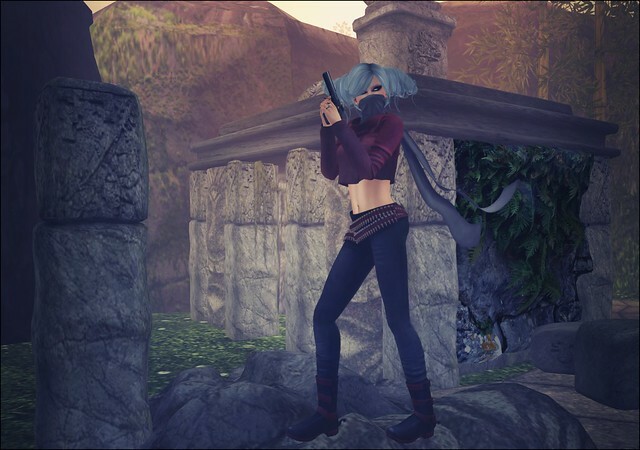 The Wayward Hunt starts at 1pm SLT on April 17th and runs until May 1st. Happy hunting, bunnies! Do you dream a lot? Do you remember your dreams? I’m a really vivid dreamer. I always have been and I can remember dreams from when I was 6 or 7 years old. The funny thing is that my dreams are never those fancypants, oh my god I’m flying and this pie is talking to me dreams. They’re more mundane, but always wonderful. I always thought SL was like a dream. A beautiful dream that everyone contributes to. The Liaison Collaborative opens up on the 15th and the theme is “Fling!” Yes, with an exclamation point. So expect lots of pretty spring awesomeness! I’m wearing the Darcy Flowers Headband by Ariskea and I just love it! Hair flowers are HUGE in my family, so it’s great to have new ones! Cae is at The 100 Block this month and I’m loving her Lumiere jewelry. I’m just wearing the necklace in this photo, but it’s so pretty. The metal in different parts of the medallions and the beads are all color change with the HUD. Hello, bunnies! I hope everyone had a marvelous weekend! I’m still in the rainforest with my family, but I just had to show you guys my new boots! They’re perfect for hiking around! Fri.day is at Collabor88 this month with the Juliette boots! They are just a little worn in, which I love [so many shoes in SL look just TOO new] and because they’re unrigged, anyone can wear them! They resize very well, so you kids out there can wear them, too. Believe it or not, shoe makers, but the kids out on the grid are HUGE shoppers and making some of your shoes and boots unrigged and resizeable means more sales for you! Pose Fair opened this weekend, and I’m using one of the Ground Sits from Kirin for this post. I love this pack and every sit is really well done and cute as can be!